A thief, a lover and a toymaker; drawn together by fate, unlikely champions against a powerful and remorseless enemy. When not fighting each other, they must confront a powerful lord and end his plan to unleash global violence. No problem. But behind the scenes, the immortal trickster is manipulating men like puppets, changing history for his own amusement. And as an ancient plan is set into motion, the trio are faced with events they do not understand and may not survive. 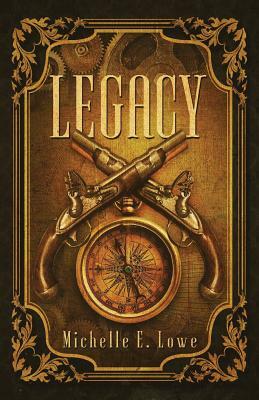 Legacy is the first of an epic new series that combines Fantasy and Steampunk in an unforgettable novel set in Victorian England. A Georgia born native, I’ve spent most my life near the Atlanta area before pulling up stakes and moving clear across the country with husband, Ben, and our two daughters. History piques my interests, especially European history. I’m a big nerd at heart. I read science-fiction and fantasy stories, and I love old B horror films. I also get a kick out of playing classic Atari video games and I do oil painting as a hobby. I’m a daydreamer and animal lover. I have a very old kitty named October, and one very demanding guinea pig. I took up writing as a serious career choice twenty years ago, learning a lot and sharpening my skills along the way. My works include several published novels such as The Warning, Cherished Thief, Atlantic Pyramid and Children’s books, Poe’s Haunted House Tour, and The Hex Hunt series. My latest published escapade is a steampunk/fantasy novel, titled Legacy, the first of a six book series.